Zanshin Dojo is comprised of a dedicated group of volunteer instructors and students with a passion for self-defense, martial arts, and individual growth. Instructors donate their time free of charge and reap the reward of watching their students grow, not only in technical skill, but physically and personally as well. With a combined 67 years of experience and extensive cross-training, instructors find joy in sharing their passion with all participants that walk through the door. Logan Priollaud first started training at the Salem Budokai in 1983 under the mentorship of Ben Coleman Sensei, progressing through the children’s and adult classes to eventually receive his Shodan in 1996. He has sought additional training in Aikido under Mark Greenfeld, Shotokan Karate under Gil Hartl and Richard Hand, and Mixed-Martial Arts and Ketsugo Jujitsu under Eric Bornstein. Rhonda Rhodes began studying Jujitsu, Karate, and Aikido in 1995. She studied DanZan Ryu Jujitsu at the Salem Budo Kai and earned the rank of Shodan in 1999. 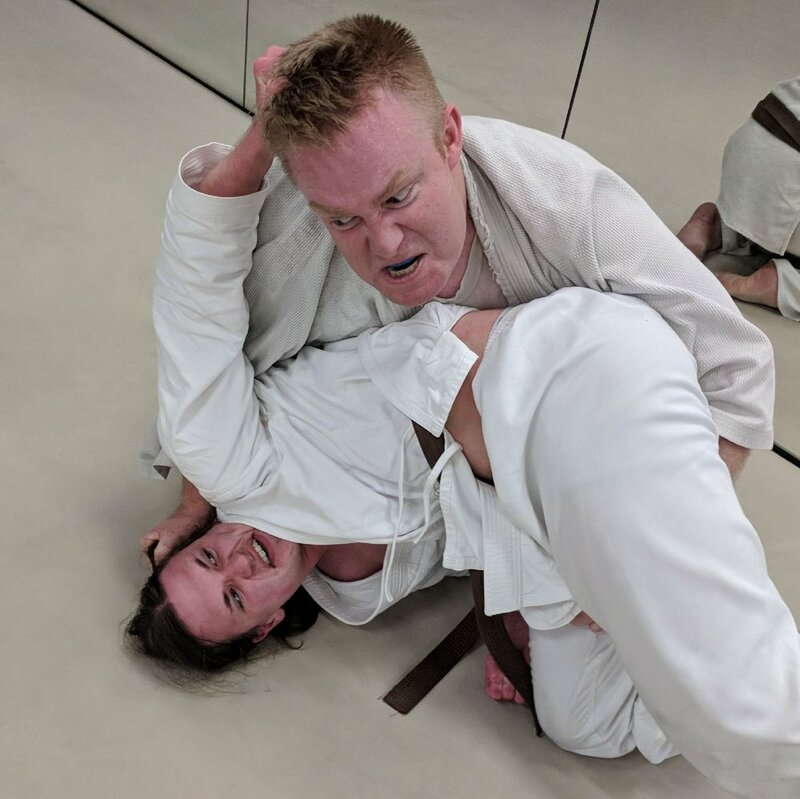 In addition to training in Jujitsu, she developed her skills as an instructor as she assisted Ben Coleman and Laura Waterman in teaching the Junior Program. Rhonda trained in Shotokan Karate under Gil Hartl and Richard Hand, and was awarded the rank of Shodan by Nishiyama Sensei in 1999. She trained in boxing at The Ring Boxing Club in Boston, MA where she also studied Ketsugo Jujitsu with Eric Bornstein. James “Spike” Muir began training in Shito Ryu Karate and Aikido at the YMCA in Tacoma, Washington from 1992-1995. He studied DanZan Ryu Jujitsu, Aikido, Judo and Karate at the Salem Budokai in Salem, Oregon from 2007-2010. Elliot Paulson Began training at Zanshin in 2011. He achieved the rank of Shodan in 2018 under the tutelage of Logan Priollaud, Rhonda Rhodes and James “Spike” Muir. 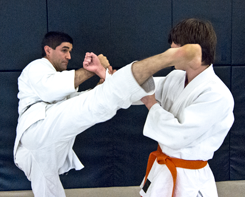 He has also has experience with Shotokan Karate, and an interest in weapons training. Eric Enright began training at Zanshin in 2011. In 2018, he was awarded the rank of Shodan under the instruction of Logan Priollaud, Rhonda Rhodes and James “Spike” Muir. He has a special interest in Boxing and Brazilian Jujitsu.